Environmental pollution is becoming more and more serious. A lot of dangerous contaminants can reach from sewage to surface water, rivers, lakes, and in the end to drinking water. Heterogeneous photocatalysis is promising method how to remove these persistent organic pollutants. Titanium dioxide is suitable photocatalyst due to its excellent properties. 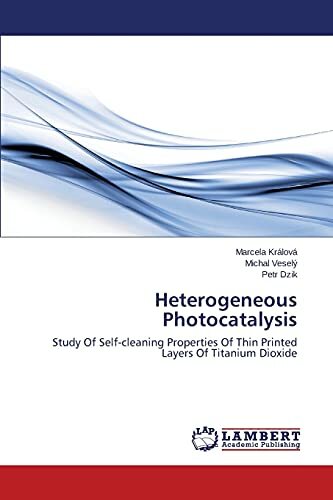 This book describes preparation of thin titania layers by two techniques: material printing and chemical vapour deposition. Two methods of sol preparation were applied; sol-gel and hydrothermal synthesis. Photocatalystic activity was evaluated as a degradation rate of model compounds as well as investigation of photoinduced superhydrophilicity. This work shows that material printing is innovative technique usable for preparation of photocatalytic active layers. Dr. Marcela Králová has obtained her Ph.D. degree in Physical Chemistry at Brno University of Technology in 2012. Since then she has worked as a postdoc in Central European Institute of Technology.